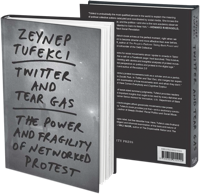 twitterandteargas #twitterandteargas Synopsis Reviews Zeynep’s Talks Upcoming Talks About Zeynep Buy the Book! Purchase the book from Amazon or Yale University Press. Looking for the Creative Commons version? Read how it came to be or find it here. If you’re interested in what’s happening in the world today, this book is a fascinating read. Even if you’re not, it's an unusually informative book about digital platforms usually examined apart from political life. Social interactions in the digital world in the context of political activity is insightfully explored through this wonderfully readable academic study. This insightful and analytical account of mass protest in the 21st century focuses on the “intertwined” power and weaknesses of new technologies that can be used to galvanize large numbers of people. … This comprehensive, thought-provoking work makes a valuable contribution to understanding recent political developments and provides a clear path by which grassroots organizers can improve future efforts. It is Tufekci’s personal experience in the squares and streets, melded with her scholarly insights on technology and communication platforms, that makes “Twitter and Tear Gas” such an unusual and illuminating work… A work that will be long cited — and deservedly so — by activists, technologists and others grasping at the relationship between our causes and our screens. “Twitter and Tear Gas” is a book that, superimposed on a seemingly familiar landscape, utterly transforms the view. The author is also insightful on how governments and politicians are moving from censorship, no easy task on social media, to attention-grabbing and misinformation. “Just as attention is under-appreciated as a resource for social movements, distractions and ignorance are under-appreciated as methods of repression through denial of attention,” she writes. Sowing cynicism is a powerful tool against protest: “If everything is in doubt, while the world is run by secret cabals that successfully manipulate everything behind the scenes, why bother?” … “Twitter and Tear Gas” is packed with evidence on how social media has changed social movements, based on rigorous research and placed in historical context. A striking and original conclusion: today’s low barrier for organizing a movement can also lead to its long-term frustrations. Tufekci’s superb book will define the debate on social protest for years to come. Tufekci is undoubtedly the most qualified person in the world to explain the meaning of political collective actions catalyzed and coordinated by social media. She knows the technology, the social science, and the politics—and she is the rare academic observer who was at the scene, from Istanbul to Cairo to New York. Incisive and illuminating, Tufekci’s book arrives at the perfect moment, right when we desperately need our activism to become smarter and more effective than ever before, or else. There have been many lessons for social movements since I spoke to crowds in Tahrir Square who had gathered after a call on a Facebook page I had launched. This incisive, unique, and timely book—brimming with stories and insightful analyses of protest movements—offers a much-needed perspective on politics and protest in the digital age. Tufekci understands 21st-century protest movements both as a scholar and as a participant, from the Arab Spring to Zucotti Park. In “Twitter and Tear Gas”, she merges her experiences into a singularly brilliant examination of how movements work and when they don’t. Informative and exciting read! Tufekci is in the perfect spot between activist and researcher to provide insights that only few can. This book sets new grounds for the analysis of social media and political mobilization. Many have asked why people rebel, but few describe how. Here, Tufekci uses firsthand observation to offer an intelligent and informed examination of the tools and nature of today’s political protests. A brilliant work. In a world of tweet-sized summary judgments, Tufekci provides readers with a depth of analysis and important insights that ought to be read by every diplomat and activist. For all the claims that new technologies afford grassroots movements new power, research on the topic is rare. Tufekci’s book provides just that—and a cautionary conclusion. No talks currently scheduled (or the site is trailing reality). Check back soon! 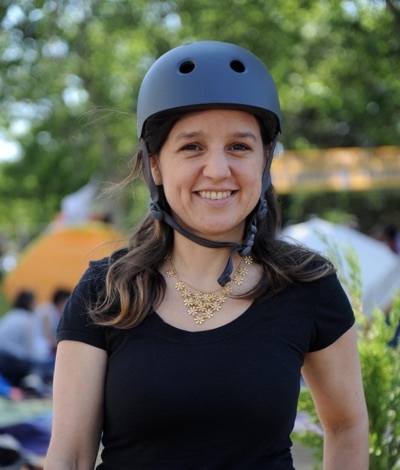 Zeynep in Gezi Park, Istanbul during the 2013 protests, wearing a helmet as protection from the tear gas canisters that were flying around. “Twitter and Tear Gas: The Power and Fragility of Networked Protest” is available for purchase from Amazon and Yale University Press. (Looking for the Creative Commons version? Read how it came to be or find it here.) Everything here is © Zeynep Tufekci (@zeynep) except where noted. Header image is CC BY-SA Mstyslav Chernov. Site produced by Justin Reese.